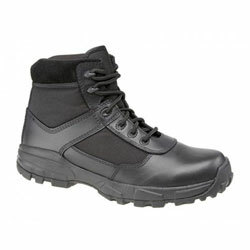 The Grafters Cover Boot M497A is extremely lightweight and has no metal components in its construction. The upper is made from leather and nylon. With a durable non-slip rubber sole, a shock-absorbing midsole and a cushioned insole, this boot is ideal for specialist officers or those who want to stay light on their feet. Not only will you be able to run in these boots, you will also be able to drive in them easily. Their non-metallic construction makes them airport friendly. The 6" version provides greater ankle dexterity and is ideal for those who do not need or want the ankle support you get from the 8".